So….you’re wondering why the fleas are so outrageous this year (ESPECIALLY IN FLORIDA! ), well let me give you a little info; The weather has so much to do with it, and here in sunny Florida we have not had any real winter to speak of. Now, I for one, am not complaining about this beautiful weather, but we have had thousands of customers that are just being bombarded by this blood-sucking pest to the point of wanting to abandon their homes–really, no exageration! The reason is simple. Fleas come in from outside. They are feasting on the blood of wildlife, birds, rodents, your pets AND you. They enter your home on your socks or pants (or on your pet, if you have one…(you don’t even have to have one, to be inundated with fleas in your home and yard, by the way) and once they are inside they are feeding on any warm-blooded mammal around. They do not discriminate! Once there, they hatch into a tiny worm-like creature covered with lots of tiny, tine hairs. This is called the LARVAE and this stage feeds on the undigested blood (okay, the flea poop! There, I said it. Are you happy now? LOL) and they hang out in that dusty area and spin a cocoon (PUPAE) where they stay (anywhere from 14-365 days!) until three conditions exist to cause them to hatch out, so to speak, and start the process all over again. Yes, baby fleas reproduce–they are actually not babies at all, they are small adults! So, if ALL THREE OF THOSE ARE NOT MET THEY STAY IN THE COCOON! That’s why the foggers you set off before you leave for vacation don’t work and when you get home expecting a flea-free abode, you 1. Walk in the door (change the atmospheric conditions) 2. Breathe and Speak “Ah…it’s good to be home” (Carbon Dioxide) and YOU ARE there, which means warm-blood is now available for dinner! If you have a flea infestation, don’t worry. We can help!! 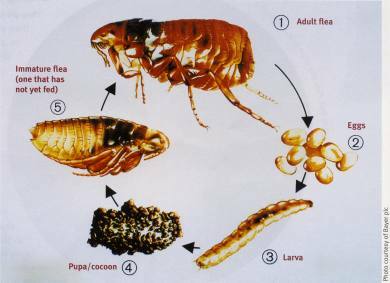 The products that we carry contains ingredients that dry out the eggs and larvae and a residual for the adult fleas that may re-enter your home (which they most certainly will if you don’t treat your yard too!!) I’m sure you noticed that I didn’t say anything about that problematic, protected from EVERYTHING (including microwave ovens–yes, we did experiments–that ‘s another BLOG in and of itself) stage; the Pupa. Well that’s because NOTHING WORKS AGAINST THAT STAGE! Sooo, that’s why it takes between 14-21 days until you break the life cycle and you are in control. Whew! That’s probably more than you ever wanted to know about flea biology, right? In any event, like I said before…We can HELP. We have the products and the professional instruction on what to use, as well as how and where to use it to be FLEA FREE. I promise. You can contact us, if you are not local to our store, we can ship you the product and viola! In 14-21 days you’ll be back to livin’ in paradise with no freeloaders living rent free on your pets, in your home and in the yard. Hope that helps. I look forward to talking to you soon.